true spirit of sportsmanship, for the glory of sport and the honour of our teams." 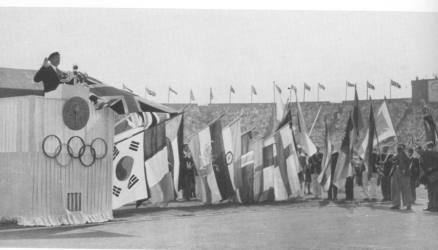 taken by Belgian fencer Victor Boin at the 1920 Antwerp Games. 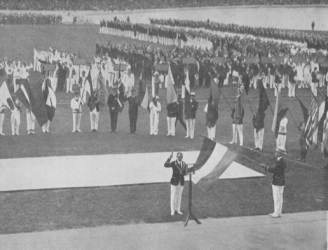 "We swear that we are taking part in the Olympic Games as loyal competitors, observing the rules governing the Games, and anxious to show a spirit of chivalry, for the honor of our countries and for the glory of their illustrious ancestors by the successive restoration of both the ceremonies and the symbolic acts which gave to the former so great and deep a meaning. "Nous jurons, dit-il, que nous nous présentons aux Jeux Olympiques en concurrents loyaux, respectueux des règlements qui les régissent et désireux d´y participer dans un esprit chevaleresque pour l`honneur de nos pays et la gloire du sport." "Nous jurons que nous nous présentons aux Jeux Olympiques en concurrents loyaux, respectueux des règlements qui les régissent et désireux d'y participer dans un esprit chevaleresque pour I'honneur de nos pays et la gloire du sport." The voice of the announcer sounds again. 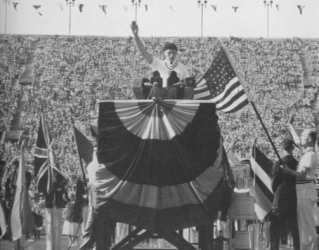 It is introducing Lieutenant George C. Calnan, of the United States Olympic Team, who will take the Olympic Oath. A tall figure, erect and military, ascends the rostrum on the field as a hushspreads over the audience. He grasps the American flag with his left hand andraises his right to the sky. "We swear that we will take part in the Olympic Games in loyal competition, respecting the regulations which govern them and desirous of participating in them in the true spirit of sportsmanship for the honor of our country and for the glory of sport." 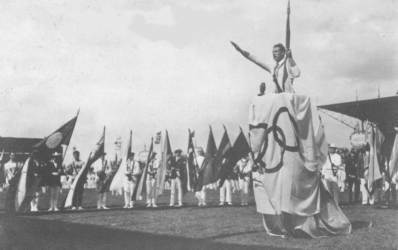 Still a second greeting was brought from the classical homeland of the Olympic Games to Berlin. 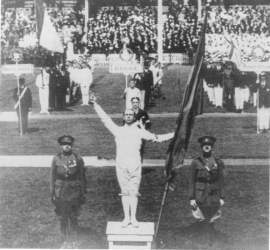 The first Marathon victor, Louis, mounted the steps to the loge of honour accompanied by the President of the Organizing Committee and the President of the Greek Olympic Committee, Bolanachi, and presented the German Chancellor with an olive twig from Olympia which he received with words of deep gratitude. 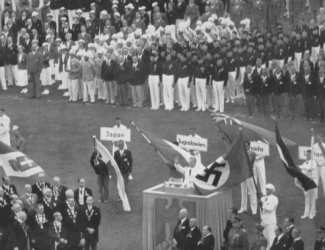 "Wir schwören, bei den Olympischen Spielen ehrenhafte Kämpfer zu sein und die Regeln der Spiele zu achten. Wir nehmen teil in ritterlichem Geist, zu Ehre unseres Landes und zum Ruhme des Sports". Tribune of Honour, takes the oath on behalf of all the competitors.
" We swear that we will take part in the Olympic Games in loyal competition, respecting the regulations which govern them, and desirous of participating in them in the true spirit of sportsmanship, for the honour of our country and for the glory of sport"
To end the formal ceremony, one verse of the National Anthem was played by the Massed Bands and sung by the choir, joined by all those assembled in the Stadium. was taken by the gymnast Dr. Heikki Savolainen, for whom these were his fifth Games. 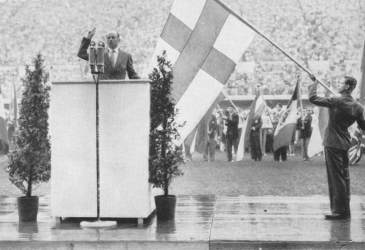 The reciting of the oath was followed by the Finnish National Anthem, in which the public joined with unusual fervour. 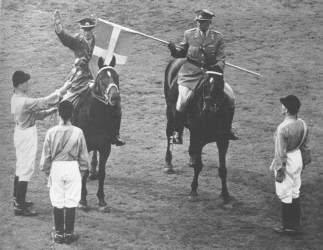 The flag bearers returned to their positions in front of the teams and the march out of the Stadium proceeded briskly through two gates at once. 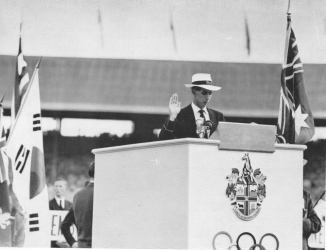 The oath was taken by the captain of the Athletic Section of the Australian team, John Landy, the world mile record holder. "We swear that we will take part in these Olympic Games in the true spirit of sportsmanship and that we will respect and abide by the rules which govern them, for the glory of sport and the honour of our country." The Olympic Oath having been taken, the Swedish national anthem, "Du gamla, du fria", is sung in unison.
" In the name of all the competitors, I swear that we will take part in these Olympic Games in loyal competition, respecting and abiding by the rules which govern them, in the true spirit of sportsmanship, for the glory of sport and honour of our Country ". The Choir of Santa Cecilia, accompanied by the Band of the Carabinieri, then sang the National Anthem. The flag bearers of the participating countries formed a semi-circle around the rostrum. 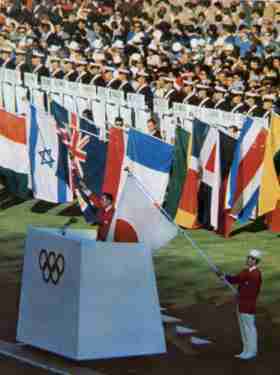 Japanese gymnastic star Takashi Ono representing the participating athletes, delivered the Olympic oath holding a corner of the Japanese flag in his left hand and with his right hand raised high. 8,000 pigeons were released, and as they disappeared from the Stadium, the whole assembly joined in the singing of the Japanese National Anthem. Five jet planes of the Japanese Air Self-Defense Force described five gigantic rings of colour-the Olympic emblem-in the sky. While the electronic music was played, Their Majesties the Emperor and the Empress left the Stadium. The delegations marched out through the north and south exits, and the Ceremony was brought to a close. 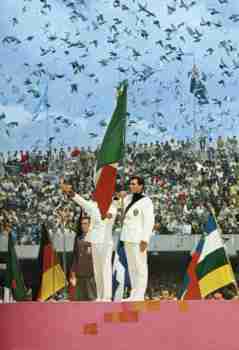 Immediately afterward, the Olympic pledge of sportsmanship was given by another Mexican athlete, Pablo Garrido, in the name of all the assembled competitors. As he concluded; ten thousand pigeons were released from cages around the stadium. A symbol of universal peace, they fluttered up and away in great widening circles. The huge electronic scoreboard lit up with the words "We offer and desire friendship with all the peoples of the world," and the band closed the day with a stirring rendition of the Mexican National Anthem. The athletes marched out. The hundred thousand spectators-who had been cheering and applauding for the past two hours-slowly followed. 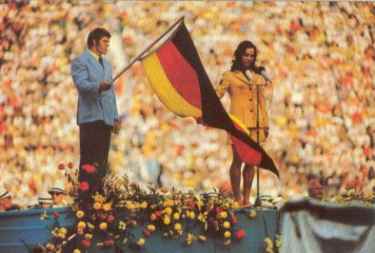 The last torch bearer - a young, unknown runner as a representative of future generations - Günther Zahn, winner of the 1,500 meter race of the German Youth Athletics championship of 1972. His stand-in was Rudolf Brumund, second winner of the 400-meter race. To speak the oath, for the first time at Olympic Games an active lady participant- Heidi Schüller. "In the name of all competitors I promise that we will take part in these Olympic Games, respecting and abiding by the rules which govern them, in the true spirit of sportsmanship, for the glory of sport and the honour of our teams." "In the name of all judges and officials, I promise that we will officiate in these Olympic Games with complete impartiality, respecting and abiding by the rules which govern them, in the true spirit of sportsmanship. " The Olympic chorus and orchestra perform the national anthem, O Canada. 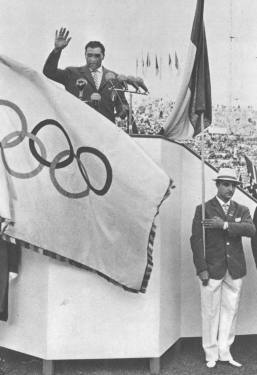 Olympic gold medallist Nikolai Andrianov took the Olympic oath on behalf of all the participants in the Games. 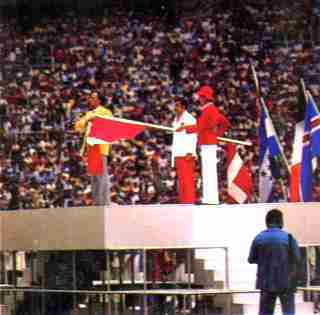 He was followed at the microphone by international referee Alexander Medved, a three-time Olympic gold medallist, who pledged, on behalf of the referees, to carry out his duties impartially, in conformity with the rules and in the spirit of true sportsmanship. 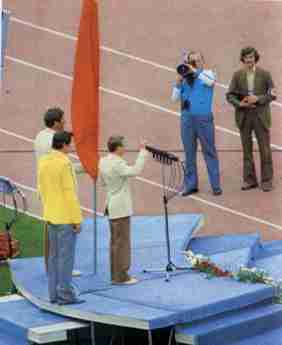 The official part of the Opening Ceremony ended with the Anthem of the Soviet Union. The delegations left the field, and the artistic and sports programme began.